Okay from my taste buds to yours, I tested tasted another gluten-free product. 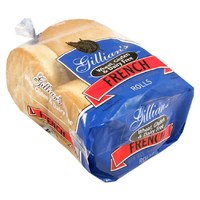 I am giving Gillian’s French Rolls a thumbs up! I feel like I struck gold. They are light and fluffy, 130 calories, 4g of fat, 20 carbs and so ridiculously filling!! If you are trying to lose weight I really think cutting down on products with gluten in them is the way to go. I feel less bloated and have a tremendous amount of energy.